Experience the finest luxury apartments in Brookhaven, Georgia at Brookleigh Flats Luxury Apartment Homes. Stylish, grand, elegant, and architecturally timeless are just a few words that describe this apartment community. You will find yourself at the center of it all at Brookleigh Flats, located close to I-85 and GA 400 in Brookhaven. We invite you to come experience a lifestyle where weekday breakfast, complimentary wash and fold laundry service, valet trash, and recycling are only a few extras that make your life a luxurious, peaceful experience reminiscent of a hotel getaway. Community amenities include two cyber lounges featuring high speed internet and Apple computers, two sports club style fitness style fitness facilities, multi-media room with large screen television, and a resort-style saltwater swimming pool. We plan to make you feel right at home! 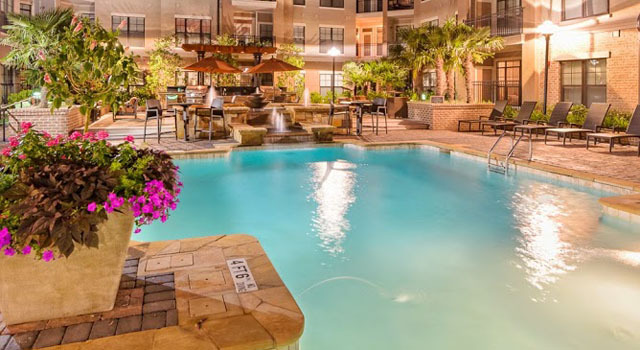 Brookeigh Flats Luxury Apartment homes is located at the heart of Brookhaven, giving you easy access to the numerous restaurants in the area: Chinese, Italian, and even Brazilian! South of Wal-Mart, Target, and Costco, Brookleigh Flats Luxury Apartment Homes is the dream of any shopper, offering centralized and advantageous shopping opportunities. Your new apartment home in also located near Blackburn Park, Publix grocery, and Starbucks Coffee for the ultimate convenience. The MARTA on the East/West line and Medical Center MARTA Station on the North/South line are just minutes from Brookhaven making a morning commute a dream for any professional-on-the-go! It is easy to discern that we have something to offer everyone!